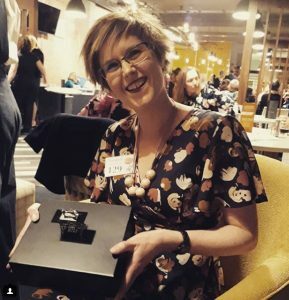 Home Exhibition Frocktails – the post-party write up and videos! 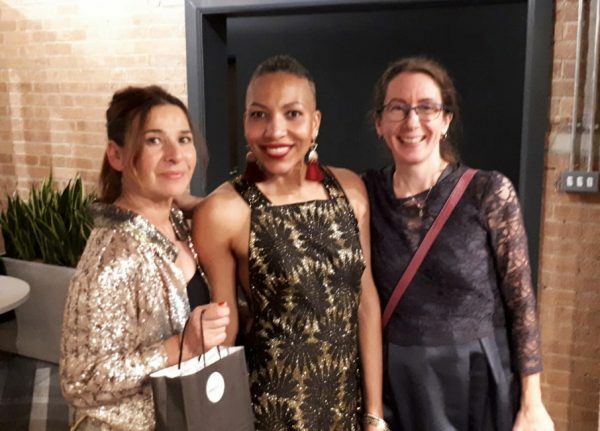 Frocktails – the post-party write up and videos! After months of planning, our fabulous Frocktails event finally came together! 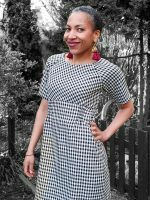 We had 12 people on our daytime workshops with three different projects running – the Tulip Dress was run by Donna who teaches regularly at the Sew Different sewing retreats. The Weekend Bag workshop was held by the designer herself, Tara. The Weekend Bag is due to be launched as a Sew Different pattern in 2019. 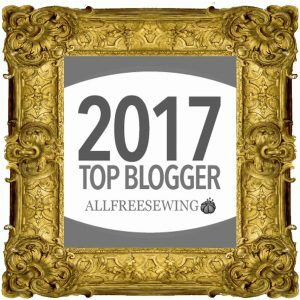 And finally Tree from Stitchless TV who was hosting the class to make her amazing statement piece, the Sculptural Bucket Coat. The evening started with goody bags and cocktails. Our generous sponsors had filled the bags with a large selection of haberdashery in including zips, ribbons and buttons from William Gee, a large and lovely bar of Galaxy chocolate from Netprinter, fat quarters of printed denim from the Denim Company as well as discount vouchers from Guthrie & Ghani, HCS Style Retreat and a 3 day gym pass for our venue, Hub 26. Laura in her newly launched Geo Dress with Naomi who had made her own dress during one of the daytime workshops. 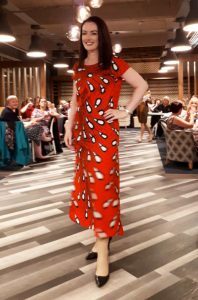 Frocktails saw the launch of the new Sew Different Geo Dress – a perfect Autumn / Winter dress with batwing sleeves and, of course, our signature deep pockets. 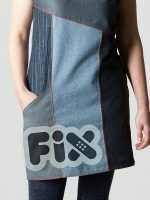 There were several versions of it on the catwalk made in range of fabrics from double knit and scuba to crepe and linen. 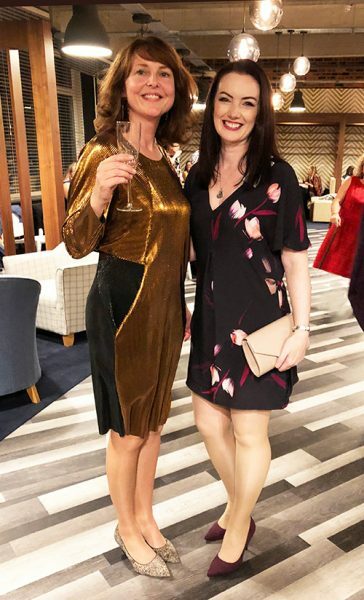 Laura (left) wears the Geo Dress in an amazing metallic bronze micro-pleat fabric from Fabworks. She has used the reverse side of the fabric for the back and side panels which emphasises its geometric structure. Also on the catwalk was the new pattern from Stitchless TV – the Japanese Zero Waste Coat and the Japanese Tote Bag. 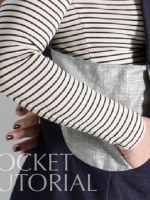 This gorgeous and easy-to-wear “coatigan” can be made in just 30 minutes and has an eco-friendly slant with its zero waste layout. 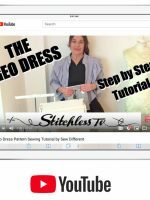 As with all Tree’s patterns, they come with a detailed and inspiring Youtube tutorial that can be found on the Stitchless TV channel. The Japanese Tote Bag tutorial can also be found here. Our models were all volunteers from the sewing community. 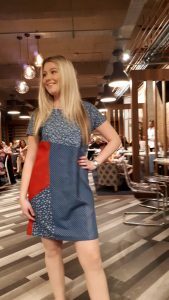 The catwalk show opened with Hila from Saturday Night Stitch who had created her own mini collection combining Fabworks fabrics with Sew Different patterns. The result was a stylish and quirky collection of garments in Hila’s unique style. For more about her work, see her Youtube Chanel here. Fabworks Mill Shop were there showcasing a range of their winter fabrics. 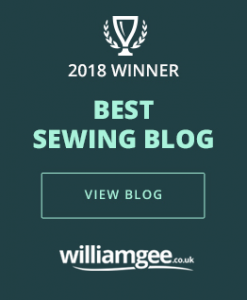 They kindly sponsored prize for the Best Dress competition – a voucher for £50 to spend on fabric along with a private tour of the the behind the scenes Fabworks warehouse. Two of our Judges, Tree and Hila, and helper, Eleanor. Tree wears her own Sculptural Bucket Coat in sequins, Hila wears a full length self-drafted dress with a crossover back. Eleanor wears a navy satin dress with a beautiful lace overlay. Our Best Dress competition winner, Hannah from the Fabricate sewcial group with her prize sponsored by Fabworks. 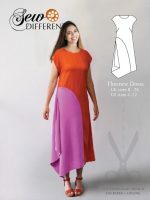 The judges said that her dress was beautifully made and a great fit (despite her having only finished it that afternoon). The Denim Company were also in attendance with a small selection of of their printed denims and some lovely garments made from their own fabrics that featured on the catwalk. Our fabric swap raised over £50 for the Alzheimers Society in donations from you generous lot. Our after-dinner entertainment was a fascinating talk and slideshow from Tree from Stitchless TV . She told us about her creative background and early career in fashion and handmade crafts that led her to become the well-known YouTuber she is today. 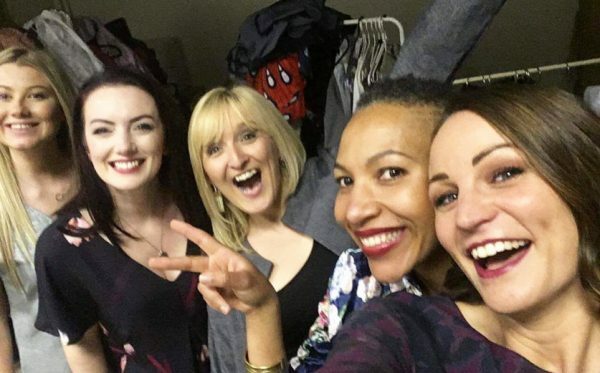 We hope to hold another Frocktails event and more sewing retreats and workshops in 2019. Please sign up to our mailing list to stay informed about our events.